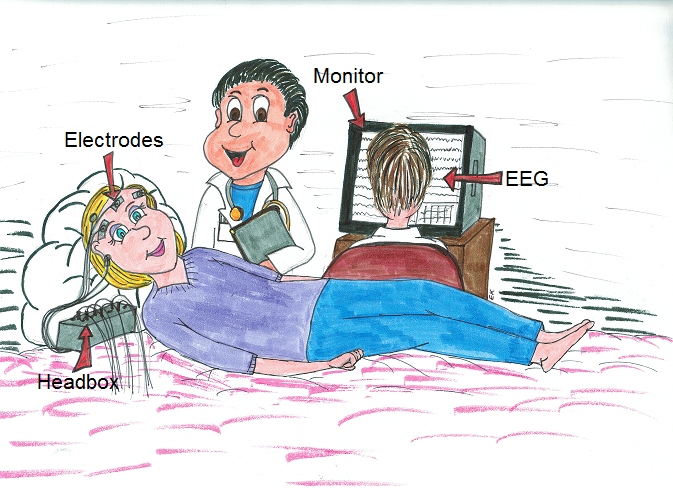 An Electroencephalogram (EEG) is a test of the electrical activity of the brain. The brain is an electrical organ made of millions of brain cells. Each brain cell acts as an electrical wire. Chemical reactions in the brain generate electricity that we are able to record using special electrodes applied to the scalp. The electrodes transmit the electricity from the brain to a special machine, called the EEG machine which displays the Brain Waves on a computer screen. Recording brain waves is very valuable for physicians who specialize in neurology in general, and in epilepsy specifically. Brain waves tell us many things about the brain, including whether brain cells are working properly or not, whether the electrical signal is normal, too fast or too slow and whether there is any abrupt changes in the electricity that could lead to seizures. There are several types of EEGs described below. A routine EEG is the recording of the brain’s electrical activity through the scalp. It is usually brief, lasting 20-40 minutes, performed either at the hospital's EEG laboratory at a doctor's office. The test if very safe and non-invasive. The goal is to record the brain waves and determine if they show any abnormalities suggestive of seizures. A number of small electrodes are placed on the scalp using a standard map. Once the study is completed, the electrodes are removed. Routine EEG's can sometimes be useful, but in general, provide only limited information due to their short duration. Frequently, a more prolonged recording is necessary to make a definite diagnosis. Ambulatory continuous EEG (AEEG) monitoring consists of a prolonged EEG recording performed at the patient's home. The same electrodes as a routine EEG are applied to the scalp, then the patient goes home with a small machine that records the brain waves continuously over 24, 48 or 72 hours, depending on each case. Once the test is completed, the electrodes are removed and the physician reviews the information on a special computer. The electrodes are sometimes applied at the doctor's office and sometimes at the patient's home. If it is more convenient for the patient and family, the EEG technologist travels to the patient's home and initiates the study. Ambulatory Video-EEG (AVEEG) monitoring is a relatively novel technology that replicates video-EEG that is traditionally performed at the hospital. It is the same as AEEG, except that there is a camera that continuously videotapes the patient while the EEG is being recorded. Prolonged EEG monitoring offer several advantages over a routine EEG. First, if the patient is having spells of unclear nature, there is a good chance of capturing them while recording the EEG and video. Recording the EEG and Video simultaneously allows the physician to compare the brain waves to the patient's behavior. For example, if the EEG shows abnormal activity or if the patient reports a typical spell, then the physician will review the video and the EEG to determine if the patient is having a seizure or not. In addition, with AEEG and AVEEG, prolonged periods of sleep are usually recorded. Recording sleep on an EEG is extremely important because many abnormalities only show up on EEG during sleep. Therefore, if the EEG is only recorded when the patient is awake, several abnormalities might be missed and the test might not be nearly as useful. With the advancement in technology, the quality of recording provided by ambulatory EEG and VEEG is comparable to the recording performed on video-EEG while admitted to the hospital. For this reason, AEEG and AVEEG are becoming more popular because they allow patients to stay home and be in general more comfortable. Furthermore, sometimes spells are more likely to occur when the patient is at home, in her/his typical environment. Inpatient video-EEG (VEEG) monitoring is considered the gold standard for the diagnosis of seizures. It is sometimes ordered if the patient is admitted to the hospital after presenting to the emergency room and sometimes is planned ahead and the patient is admitted f to the hospital specifically to have the study performed. VEEG consists of continuous EEG and video recording similar to Ambulatory Video-EEG, with the exception that it is performed in the hospital. Performing VEEG in the hospital offers a few advantages over at home and is sometimes necessary. First, the EEG is monitored on a regular basis and reviewed by the physician daily, sometimes more than once a day. This is important if the patient is suspected of having daily seizures that require rapid adjustment of the treatment. In addition, sometimes VEEG is performed with the goal of recording the typical seizures that patients are experiencing. At times, it is necessary to take patients off seizure medications, which would not be safe at home. While admitted to the hospital, nursing staff are monitoring the patient continuously and are ready to intervene and administer emergency medications if needed. In many cases, it is very important to record on Video-EEG the patient's typical seizures. This would allow the physician understand better where the seizures are coming from, what kind of epilepsy the patient has, and even whether the condition is epilepsy or something that resembles it. Inpatient video-EEG is typically performed over three to five days, but at times even longer, up to two weeks in rare cases.